Two Dark Brotherhood Initiates will become available as followers after finishing all Dark Brotherhood quests. They are found in the Dawnstar Sanctuary after you complete Hail Sithis! and begin improvements for the Dawnstar Sanctuary from Delvin Mallory of the Thieves Guild in Riften. One is a Nord female found in the main room with Nazir, usually cooking. The other is a Nord male found in the living quarters, often reading. Both initiates wear Shrouded Armor, Shrouded Gloves, Shrouded Boots, and a Shrouded Cowl, and are equipped with an Ebony Dagger. Despite being assassins, the Initiates can only dual wield if they have at least one Forsworn sword or axe. Because they do not have default arrows, their inventories must be kept stocked with arrows in order to make ranged combat viable. Also contrary to their profession, they will still not effectively kill enemies without alerting/attacking other enemies in the room when ordered to attack. The Dark Brotherhood Initiate is one of the few followers that will level with you past level 50. In addition, the Initiates are marked Essential and will not die. This makes the Initiate a good choice of follower at high levels. They cannot be recruited into the Blades and cannot be used as a sacrifice in Boethiah's Calling. They also cannot be ordered to kill other Dark Brotherhood members (including the other initiate and Shadowmere), but will do almost anything else. Nazir will praise the duo for their devotion to the Dark Brotherhood: "The new initiates are working out well. Eager, dedicated, and not afraid to get their hands wet." 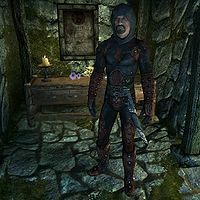 The male Initiate is a Nord assassin who wears Shrouded Armor, Shrouded Gloves, Shrouded Boots, and a Shrouded Cowl. He is always equipped with an Ebony Dagger, regardless of your level. He will greet you with "Yes, Listener? ", "I am yours to command. ", "How may I serve you, my Listener? ", "Just say the word, master/mistress. ", or "Ready when you need me, Listener." You may order him to follow you with "I command you to accompany me." He will then respond with "I am honored to be chosen." or "Lead on, Listener." However, if asked to follow when you already have a human follower, he will decline to join you: "But you already have a traveling companion. I fear I would just get in the way." When asked to do something, the Initiate will respond with "Anything you need, Listener. ", "Do you have any orders?" or "Just name it." When consenting to a command, he will state, "All right." , "I'm on it. ", or "It shall be done." After responding to a command, he will ask, "That everything?" or "Still something you'd like me to do?" If ordered to do an impossible task, he will apologize: "Sorry, Listener. It can't be done." When commanded to commit an offense against the Dark Brotherhood, he will deny your request: "I won't do it. You ask too much." If you cancel your command, he will state, "Very well, Listener." or "All right." When told to wait, he will consent with "Yes, Listener. I'll be here if you need me." or "Yes, Listener. I won't move unless you give the word." When told to rejoin you, he will assent, "Lead on, Listener." If dismissed while in the Sanctuary with "You're dismissed. Stay in the Sanctuary. ", he will affirm, "Yes, Listener. I'll be here if you need me." If released outside of the Sancutary with "You're dismissed. Return home. ", he will state, "I will return to the Dawnstar Sanctuary immediately, Listener." If told "I need to rearrange your equipment. ", he will simply consent with "Of course." If you have broken the tenets of the Dark Brotherhood, he will state, "With all due respect, Listener, you broke what few rules we seem to have. Nazir insists you talk to him and work this issue out." 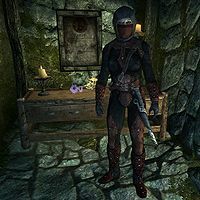 The female Initiate is a Nord assassin who wears Shrouded Armor, Shrouded Gloves, Shrouded Boots, and a Shrouded Cowl. She is always equipped with an Ebony Dagger, regardless of your level. She will greet you with, "Listener. It is an honor to stand before you. ", "Yes, Listener? How may I serve you? ", "How may I serve you, my Listener? ", "I am yours, master/mistress. ", or "Walk always in shadow, my Listener." You may order her to follow you with "I command you to accompany me. ", to which she will respond, "I am yours, Listener." However, if you already have a human companion, she will dither: "Oh, well... You seem to already have assistance. Surely you mean to remain inconspicuous..."
When asked to do something, she will ask, "Of course, Listener. What is it?" While conveying your order, she will state,"Command me, my Listener." Before executing your command, she will say, "Of course. Right away." or "Right away." After responding to a command, she will ask, "Still something you'd like me to do?" or "Is that all?" If ordered to do an impossible task, she will apologize with "If only I could, Listener." Despite her obvious devotion to you, when commanded to commit an offense against the Dark Brotherhood, she will balk: "But Listener... Are you sure? I just can't bring myself to do it..." If you cancel your command, she will say, "As you will." or "As you wish, Listener." When told to wait, she will confirm, "I'll remain in this location until ordered otherwise." When told to rejoin you, she will say, "Yes listener." If dismissed while still in the sanctuary, you will tell her, "You're dismissed. Stay in the Sanctuary." She will then say, "Of course. But if you need me, just give the order." If you dismiss her outside of the sanctuary with "You're dismissed. Return home. ", she will affirm, "Yes, Listener. I'll return to the Dawnstar Sanctuary without delay." If told "I need to rearrange your equipment. ", she will simply consent with "Yes, Listener." If you have broken the tenets of the Dark Brotherhood, she will refuse to speak to you: "I do apologize, Listener, but Nazir made it clear the initiates are not to speak with you until you first deal with him, and atone for your actions." Strangely, both of the initiates are marked to respawn if killed. However, due to being marked as Essential, they can never die and will never utilize this function. The inventories of these followers may reset, causing items they are carrying to be permanently lost. This bug is fixed by version 3.0.10 of the Unofficial Skyrim Legendary Edition Patch.